In 2019, it’s hard to underestimate the value of the right seven-second clip. 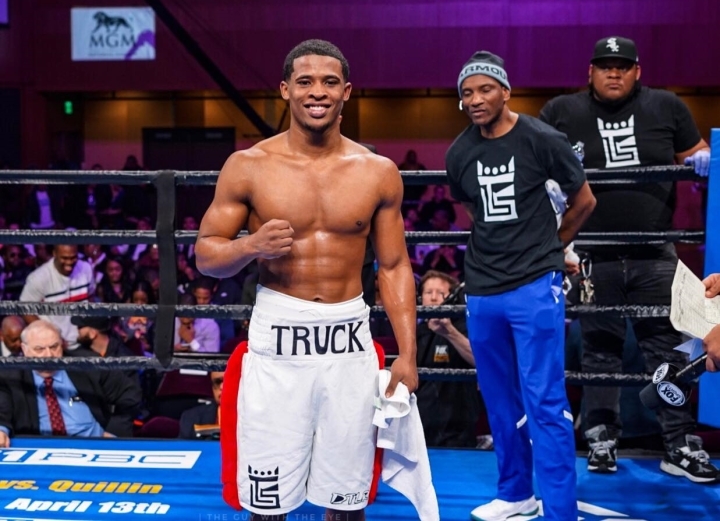 Last Sunday, promising 19-year old super middleweight prospect Lorenzo Simpson of Baltimore, Maryland picked up his third win as a professional. It was the first time going the distance, a milestone for any young fighter. It was also part of night of fights on FS1 that, according to BoxingScene’s Jake Donovan, averaged just under 300,000 viewers as part of the primary telecast. Simpson’s four round contest with professional debutante Jaime Meza was aired as part of preliminary coverage. We can assume it averaged fewer viewers in its pre-prime time slot. In the opening moments of Simpson’s win, Meza came charging out of the corner at the bell, missing so wildly with a right hand he pirouetted. Simpson calmly stepped around and whipped home a southpaw left cross to deposit Meza on his trunks. One week later, the seven-second clip on the PBC twitter feed reads that it has been viewed 330,000 times. By Monday afternoon, TMZ had a headline piece with Simpson describing how NFL star Odell Beckham reached out about the early career highlight. Simpson has earned ample local and growing national coverage since early in his amateur career in Baltimore. Now, with a perfect clip storm in the age of social media, one of boxing’s most talented young prospects has begun the process of going worldwide. In another era, a young man with Simpson’s amateur credentials might have hung around in the unpaid ranks longer. He would have been a favorite to land a spot on the 2020 US Olympic team and had a strong chance to medal for the United States. A six-time National Silver Gloves and 2017 US national junior champion, Simpson was the top rated 165 lb. amateur in the country when he elected to get paid for his efforts. Part of that good job is adjusting to professional opponents fighting to put food on the table. The clip of the Meza knockdown obscures what followed. Meza got up off the floor and, while losing every round, gave a hard, honest effort and tried his best to defeat Simpson. It’s still early for Simpson but the promise is clear. His height, speed, technique, and frame suggest a fighter who can be a factor for years to come at super middleweight and light heavyweight. The wait for the Olympics was more than Simpson was willing to endure. He’s got an ambitious idea of when he might be ready for professional gold in its place. “21 years old, close to 22, I think I’ll be fully developed, fully ready,” he replied when asked when he thought he might be ready to challenge for his first professional title. Along the way, that will mean plenty of opportunities for more highlights to catch the eye and build anticipation for the moment he takes his shot. For many fight fans, seven seconds in 2019 will always be their first memory of his journey to get there.